Happy Saturday bookish loves! Today I finally feel ready to discuss NOS4A2. 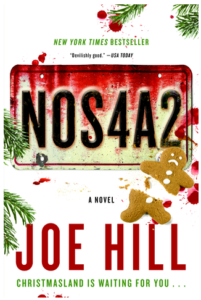 I finished NOS4A2, by Joe Hill, almost a week ago and still do not think that I have a truly cogent way of explaining my love for this book. However, one of my 2018 book goals is to review every book I finish so here we go…. This book was so unique, so dark and amusing, so full of references to King works, so replete with character and world development, I find myself still pondering it days after completion. Halfway through I ordered a copy for my sister and had it sent to her because I just needed to share this with someone. This book tests the line between the world around us and the world we create with our minds. Our villain, Charles Talent Manx (the III, I believe), is a vampire of sorts and so devilishly charming that he almost fooled me into developing a soft spot for him. He was all kinds of evil and powerful and wonderfully creative. Next comes Victoria McQueen – Vic is our heroine. She was powerful in her own right – using her powers to ‘find’ things that had been lost – losing a little of herself every time she used her gift. The loving, yet apprehensive mother of Bruce Wayne Carmody, Vic’s strength (both mental and physical) are pushed to the limits numerous times during the story, all on account of Manx. Unfortunately, her little Wayne feels the pull of Christmasland and we watch his soul go on one hell of a dangerous ride! Then we have our minor characters, who were so well drawn and complete – my favorites, Maggie & Lou, were so important to this story and in my opinion, two of the most likable people in the action. Both misfits, they were real, engaging, loyal and brave. This book is long, really long, but worth the ride if you put in the time. I may read it again next year around Christmas – making it a sort of tradition. After all, once you go to Christmasland, you never want to leave!